The first Intertidal Art Museum, Coralarium at Sirru Fen Fushi. The government has ordered the Fairmont Maldives Sirru Fen Fushi resort at Shaviyani atoll Gaakoshibi to remove the displayed statues. Spokesperson of the President's Office, Ibrahim Muaz Ali tweeted this evening saying that the President's Office have received reports that "idol" statues have been place at Sirru Fen Fushi and the Tourism Ministry is now working with the resort management to remove them. The Intertidal Art Museum opened at Sirru Fen Fushi is the first of it's kind in the world. The museum named Coralarium featured 14 statues depicting human form. 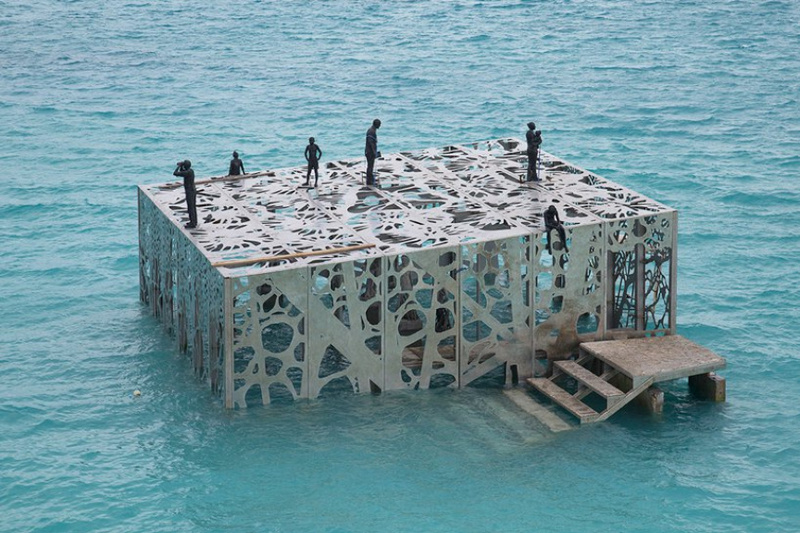 The museum is designed by the English Sculptor, Jason deCaires Taylor, to attract the effects of sea-level rising. The government has ordered the statues to be removed at a time the leading religious in the country have openly protest against them.